A pair of seesaw blocks. Seesaw blocks are obstacles that are pairs of blocks that together, act as a scale. They are only found in Pikmin 2 and Pikmin 3, and only aboveground. One of the blocks in a pair is low enough to walk onto, the other higher, but still low enough for Pikmin to be thrown onto it. The block with the most weight on top of it will go down, and the other will go up in the process. Their purpose is to provide access to higher ground. "Carrying" numbers appear above the blocks, allowing players to understand the weight exerted on each one. In Pikmin 2, the leaders have no influence on the weight a seesaw block is submitted to, but they do in Pikmin 3. In Pikmin 2, these blocks are made of stone, and the two blocks in a pair are almost always found right next to one another, with the exceptions being the ones near the Air Brake and the Massage Girdle. In Pikmin 3, they look like decorated boxes, and the two blocks in the same pair are always found far away from one another. In addition, there is another obstacle called an elevator platform that functions the same, but is presented differently. To use the seesaw blocks, the player must have their leader stand on the lower block and throw Pikmin onto the higher block, such that there is more weight on the other block; at that point the leader and Pikmin left with them will raise up, allowing them to walk onto the ledge above. Unfortunately, this means some Pikmin must be left behind, leaving the player with fewer up the top and the chance of forgetting where the others are. Fortunately, there are a number of ways to get around this. Throwing a few Purple Pikmin to the higher block reduces the number left behind, as they weigh more. To reduce the number further, with both leaders, one of them should remain at the bottom and take the other to the top by outweighing them with one Pikmin. Next, the player should throw all the Pikmin from the lower leader to the higher one on the ledge. The drawback is that this allows only one leader to get to the top. Alternatively, the player can throw all Pikmin up onto the target ledge except one, then use that one to outweigh both leaders (on the lower block) and raise them to the higher position where the other Pikmin are. This, however, leaves one Pikmin down below, prone to being forgotten. Another, harder method allows one to get all Pikmin and leaders up. The player must throw all but one Pikmin on the target platform (preferably a White Pikmin). The player should throw the final one onto the higher seesaw block, then quickly call it back, so that it reaches the rising block during the weight shifting animation, which cannot be interrupted. Once the Pikmin is close, the leader can throw it on the target platform before the seesaw blocks' animation is over. If done successfully, the player should have all Pikmin on the target platform and the leaders on the higher seesaw block, without said block going down, giving the leaders the chance to walk onto the ledge. Alternately, that last Pikmin can be thrown diagonally across the higher seesaw block, onto the ledge, such that it walks across the block and makes the leaders rise when whistled. Particularly: It seems that by having X weight on block A, and X + 1 on block B, it will not be enough to make block B go down. Confirm and elaborate here. In Pikmin 3, because the matching blocks are far away from one another, two leaders are needed to operate them effectively. The leader that should go up should stay on the lowered block, while another leader near the other block should throw Pikmin to increase the weight there. Meanwhile, the first leader will rise up and access the ledge they needed. If the player wishes to bring Pikmin up with them, it is recommended to throw said Pikmin onto the upper ledge, instead of letting them ride on the block, otherwise that will just mean more Pikmin will have to be put on the other side to balance it out. Particularly: Add missing Pikmin 3 locations. Awakening Wood: one pair is used to get to the Air Brake, at the southwest, and the other is near the White Flower Garden on the northeast, providing access to the area that leads to the Bulblax Kingdom. These seesaw blocks near the Bulblax Kingdom are slightly larger, and use a different model. Perplexing Pool: one pair can be found at the central west, providing access to the center of the area for players that take the western path, and the other two pairs belong to the group of four blocks at the north, needed to get to the Massage Girdle. Tropical Wilds: there is one pair, with one block next to the beach at the north, and its counterpart inside the tree structure the first block leads to. Pikmin can be thrown onto the second block from the outside by use of a nearby Bouncy Mushroom, and can be called by having a leader peek under a hole to the west of the structure. Tropical Wilds Remix: One block is on the same beach as its Story Mode counterpart, while the other is near the entrance to the Sandbelching Meerslug arena. Elevator platforms are pairs of tin cans, bound together by a piece of rope, hanging from a pulley system. They act the same as seesaw blocks, but instead of protruding from the ground, they rise and lower in the air. Despite being possible to walk under them it is not possible to get crushed by them. In Hey! Pikmin they act as minor obstacles and are presented in three different colors; red, yellow, and blue. However, in Pikmin 3 and the Super Smash Bros. series they're only red. Garden of Hope: there are two pairs in the western area with the Astringent Clump; both pairs are necessary to reach this fruit, and one must use the first pair to reach the second pair. The latter platform on the second pair has three large bolts attached to its rope, meaning it needs at least a weight of 10 to be lifted. Alternately, Winged Pikmin can be told to charge at the fruit to get it. There is also another pair in the cave with the Dusk Pustules. Beastly Caverns: in the Collect Treasure! version of this stage, the east cave has a pair of elevator platforms. One has a Sunseed Berry, with a registered weight of 15. Moving it off the platform will lower the other platform, which holds White Pikmin, two with bomb rocks. 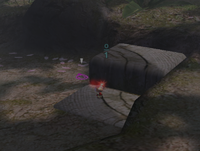 Ordeal of Flame: seesaw blocks are found multiple times in this area. A pair of red ones are found in the beginning of the level. Then, after going in a tunnel, there are two blue ones. Both of these are blocking the main path. There are also two yellow ones that the player needs to manipulate to go through a tunnel leading to the Automatic Fortune Teller. There are two more sets of them close to the end of the level, one red and one yellow, and they are blocking the Dual Wheeler. Main article: Garden of Hope. Elevator platforms are a stage hazard in the Super Smash Bros. for Nintendo 3DS and Wii U and Super Smash Bros. Ultimate arena "Garden of Hope". They surround the main platform of the stage, with one to the left of it, and its pair to the right. If weight is put on one of them, it will sink, and the other will rise. If there is no weight on either, they slowly return to a neutral position. The Peckish Aristocrab can fall off the stage and very quickly pull down one of the platforms, rapidly raising the other one. If the platforms leave the screen, they disappear, but return after a few seconds. Main article: Seesaw block glitch. There is a glitch that can teleport a leader next to the ship. It is performed by having a treasure return to the ship while the leader is moving up on one block of a set of seesaw blocks and is, therefore, only possible at the Awakening Wood or Perplexing Pool. When the treasure cutscene finishes, the leader will be inside the block, and can walk about within its boundaries; but if he moves off one side, he falls out of the level and reappears at the ship. The side of the ship he reappears at is the same as the side he walked off the block. This glitch may be used in the Awakening Wood to obtain Blue Pikmin early, which makes the 6 day run possible, and in the Perplexing Pool, where access to the Shower Room is gained without demolishing the electric gates before it. In some circumstances, the weight exerted on a block can make no logical sense. Leaders don't weigh anything; the numbers do not go up when one or both leaders are on top of a block. If a leader is holding a Pikmin while on top of the block, the number will reflect the weight of the Pikmin, unless it is a Purple Pikmin. A held Purple Pikmin only weighs 2 units, instead of the usual 10. When a leader is holding a Pikmin, one extra unit of weight is applied on the block. This glitch happens on seesaw blocks, but not on elevator platforms. Winged Pikmin can never contribute to a seesaw block's weight. When airborne, this makes sense, but if a Winged Pikmin gets knocked back by an enemy while attacking it (e.g. a Yellow Wollywog), it will be grounded for a bit, and then walk for a few seconds to chase after the enemy. Even in this state, it will still not contribute any weight. Seesaw blocks in Pikmin 3. The set of four blocks in the Perplexing Pool. Brittany and her Pikmin on some elevator platforms. A pair of elevator platforms. Brittany and Yellow Pikmin using an elevator platform. Captain Olimar's weight, shown as 0 after pausing the game. In Pikmin 2, if a leader is standing on a seesaw block alone, no weight value is shown. But when the player pauses the game, the fraction numbers actually appear, and reveal that leaders weigh 0. The same also happens with paper bags, since they are internally seesaw blocks. Paper bag - another obstacle that uses the Pikmin's weight, and technically, is in fact a single seesaw block with a different appearance. This article was a featured article from August 29th to October 3rd, 2008. This page was last edited on April 5, 2019, at 20:18.